I woke up this morning thinking about this evening when I‘ll start reading the new JK Rowling novel. 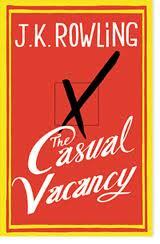 Yes, I am one of the fans who will get hold of The Casual Vacancy today and start reading it straight away! No matter if I like The Casual Vacancy or not (although I suspect I will), JK Rowling has created some great memories for me as a reader, and as a bookseller. I know there are more special moments to come. I started reading Harry Potter when it was first published in 1997, and although I would have loved to claim that it was due to my great book sense, the truth is I read it because I was a bookseller. My local rep brought me copy and was raving about this brand new author and the beginning of a new series. I was a bit sceptical at first, but I respected his reading tastes, so I gave it a try: I immediately fell in love with the story of this little boy wizard. I read all the next volumes, usually as soon as I could get my hands on a copy and they worked their magic on me, making me feel like a little girl again. Harry Potter ‘magic’ happened also for me in the bookstores. I am a third generation bookseller, I’ve worked in bookstores all my life and books are my biggest passion. JK Rowling made my wildest dreams come true when I had a chance to work in bookshops on the days of the release of each consecutive volume. I will never forget all the kids, swarming through the store with eyes like saucers, clutching their copies of the new Harry Potter books like they were the most precious things on earth. I may never see it again, but being part of it was truly an experience of a lifetime. I had another incredible experience with JK Rowling – it happened on the day when I met her for the first time. Upon the publication of Harry Potter and the Goblet of Fire, I was fortunate to be chosen as one of 50 people to meet her at a private lunch. I was also selected to sit right next to her! She struck me as a rather shy and reserved person, but she listened carefully and became very animated once we started talking about her writing and what it meant for readers and booksellers. Her passion was obvious and highly infectious. I was impressed by how unassuming, grateful and humble she was. The memory of that amazing hour with JK Rowling will stay with me forever. I know I still have more memories ahead since I am a mother now and one day soon I will be able to take my son with me into the magical world of Harry Potter. I know it will be very special. I have great respect for JK Rowling, both as person and as a writer; and for me and millions of others she is simply a great storyteller! Today, I look forward to reclining in my favorite reading spot and ‘meeting’ a different version of JK Rowling – the writer. I simply can’t wait! …maybe I’ll stay up all night reading…..
Are you planning to experience this new creation from JK Rowling? What are your expectations?